“It’s no joke being a bus shelter in Rushden High Street these days. Buses just don’t want to know me anymore, and people are always complaining. “Like those people at the Independent Wesleyan Church. They say I hid their noticeboard or something, and they have complained to the authorities, I know. “What they don’t seem to realise is I can’t help it. There is a one-way traffic system in High Street these days, and I’m only wishing that someone will hurry up and take me down. “It’s heart-breaking just sheltering shoppers from the rain, especially to decent bus shelters. Mr. H. H. Hirons, who represents Rushden Trades Council on Rushden and Higham Ferrers Road Safety Committee, suggested to the committee on Monday that the bus stop at Station Road, Rushden, should be re-sited. He contended that when up to five buses drew up at the stop, traffic travelling northwards was held up, and traffic coming the other way found it hard to get past. Mr. Cyril Freeman agreed that it was a first class idea to have the stop moved as vehicles coming out of Station Road were in a blind spot. Sergt. A. V. Allen, Rushden police, wondered if it was a good idea  especially as it might mean further restrictions on High Street parking. Mr. E. G. Tompkins was also against the idea if it meant this. He said he knew of three businesses in that part of Rushden which were going to have to close in the near future because of the effects of the one-way system. But Mr. Hirons reminded Mr. Tompkins that the main object of the committee was to discuss road safety  not to worry about businesses which were closing. He did not hold with parking in the High Street as there were parking spaces elsewhere. Representatives of the Ministry of Transport, the county surveyor, the police and the United Counties Bus Company have decided that to re-site the bus stop in High Street, Rushden, north of Station Road, to a position on the south side of the junction, “would not be in the best interest of road safety,” Rushden Urban Council was told on Wednesday. The council’s suggestion that the bus stop should be re-sited would also not be in the interests of traffic generally, the council learned from a report of a meeting with the representatives on February 5. 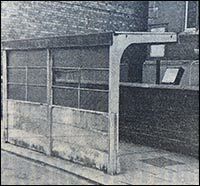 At the meeting it was stated that if the re-siting was effected, the visibility of drivers emerging from Station Road would be obstructed by stationary buses, and the visibility of drivers passing a stationary bus would be obscured in regard to pedestrians either on or about to use the pedestrian crossing. It was also pointed out that although these danger factors would be minimised if the stop was re-sited in the vicinity of the Railway Hotel, this position would not be so convenient for bus users, and would neutralise the recent unilateral waiting order at that part of the road. The bus company were not willing to adopt another suggestion by the council for a bus stop south of Portland Road (near the car park) in substitution for an existing stop outside the CWS factory and the temporary stop near Newton Road. The highways authorities had no objection to this proposal, however, it was reported. The highways authorities equally had no objection to a stopping place in Rectory Road, opposite to the junction with Coffee Tavern Lane, subject to any necessary amendment being made to the existing car park on the site, but the bus company would not accept such a stopping place in substitution for the existing stop near the CWS factory, only in addition to the stop. It was also reported that the bus company did not consider a passenger shelter to be necessary in Rectory Road as the stops were used more for setting down than for picking up passengers.